NEW! 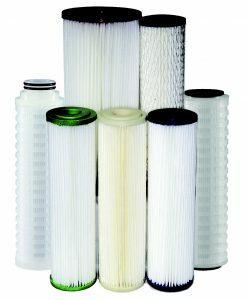 PENGUIN PLEATED FILTERS work equally well in fresh, brackish or salt waters. These cartridges are manufactured using a proprietary, electrodsorptive media technology that is capable of removing submicron pathogens and inorganic contaminants through electro-adhesion and ion exchange. This technology makes it possible for a nonwoven media to produce filtration efficiency comparable to membrane filtration but at very low pressure drop, with high flow rates and high loading capacity. The PSM media consists of coated micro-glass fibers that is produced using a wet laid nonwoven manufacturing technology. The base media is laminated between layers of spun-bond to provide both strength and pleat support. The media in these cartridges efficiently retain inorganic and organic particulates, cell debris, endotoxins, virus, proteins, many colloids, bacteria and inorganic submicron particulates. Contaminants are removed by being exposed to a torturous path through the media, depth and the powerful electropositive charge. The PSM Filter Series are available in 2.5-inch and 4.5-inch diameters, and in 5 to 40-inch lengths.